The deck came in a box with compartments for the 78 gilt edged cards and an explanatory booklet. 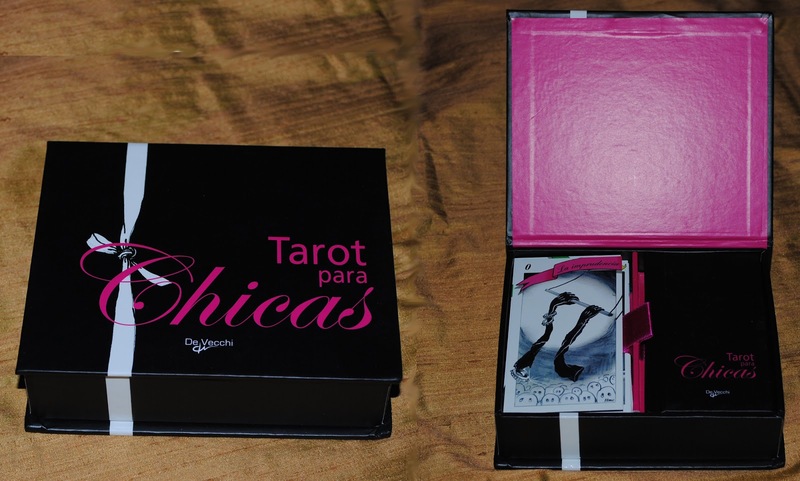 Booklet and the card titles are Spanish only. 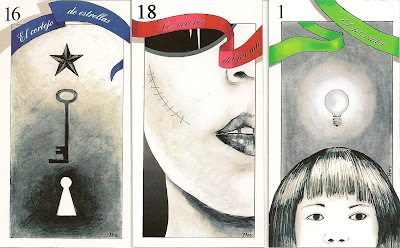 There exists also a French edition from 2009 called Le Tarot des Filles. The images on the Majors departs considerably from the established tarot, all Majors are renamed. The Minors are pips and the suits were renamed Emocion/ Accion/ Mental/ Triumfes rapidos. Joseph Hilton McConnico is a designer and artist who was born in Memphis, Tennessee but has lived and worked in Paris since 1965. He worked for fashion labels and as art director for films. Alice Bensimon also created the El Tarot de las Mafias which is ment as the corresponding Tarot for men.